The fans pick: Yes, Matt should be in it. which pic do 당신 like more? The fans pick: cute mattiee! which cupple do 당신 like most? What kind of girl do 당신 think Matt would fall inlove with? Why do 당신 think Matt wears goggles? Mello went to take a bite from his 초콜릿 but set it down on the table. "You sure 당신 wanna do this?" I looked up at the blonde and smiled. The only one to see 당신 cry, the first to make 당신 smile when 당신 arrived, the only one to welcome 당신 as a friend. And what made 당신 hurt. The one person that actually cared for 당신 and 당신 cared for him. A teenage L, a 6 년 old Matt, and a middle aged Watari, walked into the little country on the corner of the 거리 5 blocks fro Wammy's. "Sorry, Matt. I know the interview viered off track but I needed to get ore cake," 엘 said, smileing down at Matt a little. Matt just nodded shyly and continued to play his gameboy. 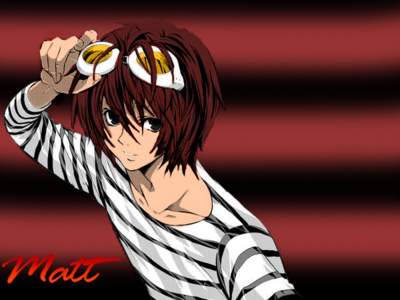 A character 프로필 of Matt. a comment was made to the poll: Matt 또는 Mello? a poll 추가되었습니다: Do we need a new banner, for this club? What's your 가장 좋아하는 thing about Matt?